Have you ever thought about staying in a club village in the Camargue? If so then come and drop your bags at the Yelloh! Village du Port, this is definitely the place for you! 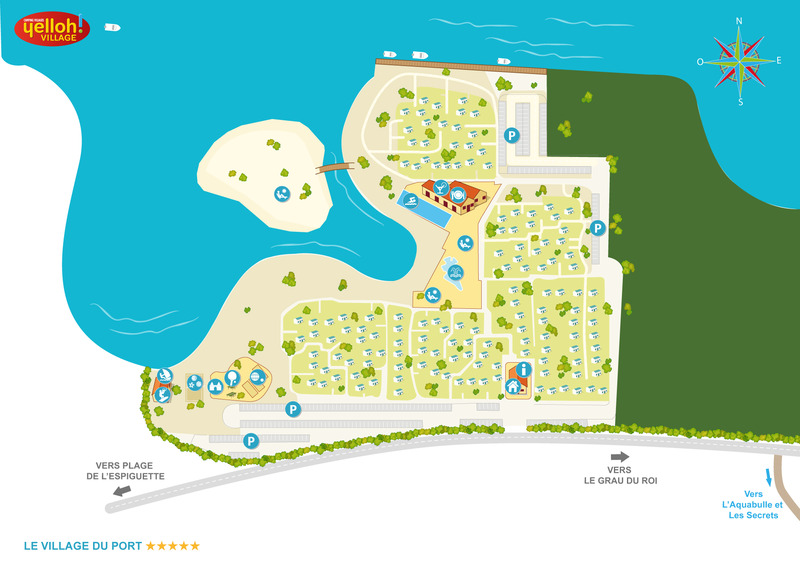 At Le Grau-du-Roi, the Village du Port holiday club has everything you could possibly wish for, starting with its ideal situation: in the heart of an unspoilt site, on the banks of the Port-Camargue sea canal... And all that in a peaceful, tree-planted environment that is 100% car-free. In our club village in Languedoc-Roussillon, your family holiday is set to be truly fit for a king: a heated swimming pool and aquasplash, a watersports centre, a restaurant, all the atmosphere of a traditional Mediterranean “fishing village” from reception to your accommodation... And for even more activities, simply head for the Village Centre or L’Aquabulle areas, just 5 minutes away. And if that’s still not enough for you... The Village du Port has its own boat launch facility with private pontoon, ideal for mooring your boat. A holiday village that is truly exceptional in every sense! Good facilities, entertainment and accommodation. A well-equipped camping site, a nice cottage, great swimming pools and excellent animations. very nice and kind people. Discover the Camargue in all its beauty and authenticity during your family camping holiday at the Yelloh! Village du Port, in the Gard. A region appreciated as much for its natural heritage as for its good life. Throughout your stay in this club village in Le Grau-du-Roi, you’ll feel truly at one with the flamingos, white Camargue horses, black bulls plus all the other traditional symbols of this unique region so rich in character. The ideal occasion to discover innumerable beauty spots such as the historical town of Aigues-Mortes: on one side the salt pans of the Salins du Midi, on the other its incredible ramparts... Magic and enchantment guaranteed! Take time out to visit Port-Camargue and its marina or Le Grau-du-Roi and its historical town centre... You can’t fail to fall under their charm! Not far from the Village du Port, discover Montpellier and its Place de la Comédie, Nîmes and its Gallo-Roman arenas, the famous Pont du Gard... So many unmissable places that are simply waiting for you and all the family!